Being on a primer of the ways of creating awesome and unforgettable models, bye ye olde model builder, Scott Van Aken, proprietor of Modeling Madness, an internet production of incredible foresight. When originally approached to pen something on modeling techniques, it was difficult to determine what would be the best subject to broach. Metal finishes, canopy masking, working with resin, fillers, how to apply photo etch....these subjects all sped through my brain (actually a pretty quick trip). However the one thing that I always look for when peering at models, is how well does one do the basics. Frankly, for contest models, this is step one in the 'how to judge contests' handbook. There really is nothing more basic than initial preparation. Once the shrink wrap has gleefully been rent from the packaging and the inside bag torn asunder, step 1 should be a good reading of the instruction sheet. "What!!" you think, "Read the instructions?? How mundane, how plebian......" how necessary. Some kits, such as most Accurate Miniatures products, require slavish attention to step by step construction to prevent major screw-ups during construction. Others can be pretty well ignored, especially if you have built a number of kits. For sage wizards of plastic such as myself, (stop that snickering back there!) reading the instructions lets me know if I can build the kit in a number of subassemblies that can be brought together later, or if I need to follow a specific sequence. It also is helpful to know how many parts need to be prepainted and what colors are needed. Once that is done, step #1 is to start removing mold seams from the parts. Every kit has them, some more prominent than others. To take these pesky buggers off your parts, you should have an array of hobby knives, sandpaper and sanding sticks, a steady hand, and some sort of magnification device. I use an Opti-visor, but there are a number of other fine low power magnifiers on the market. These items are a real boon when it comes to parts clean up. Before removing parts from the sprues, clean up as many of these mold seams as possible. It really is easier and keeps one from breaking the parts or having them fall into the carpet where the carpet gnomes will scurry off with your part, never to be seen again. 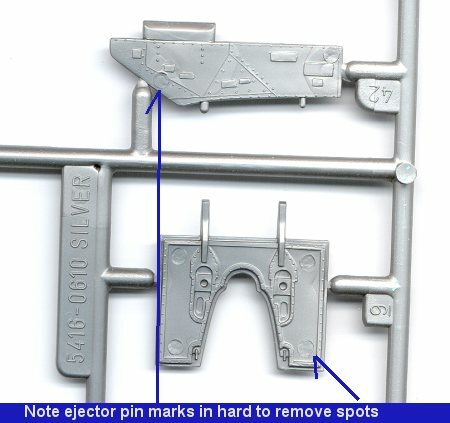 While removing molding seams, look for ejector pin marks that may be visible once the model is built. Now is a good time to either fill or sand them off. If removing these pin marks will trash some detail, you will have to determine which is the greater evil; loss of detail or big honking pin release mark. Once you have the parts cleaned up as much as possible and maybe painted, it is time to remove the parts. There are several methods. First is to just tear them off the sprue. Generally not something one does after the first few models as it can damage the part. More advanced modelers use some form of cutting device to remove them. You can use an X-acto knife (down side is cutting yourself and possibly cutting a gouge in the part). You can use sprue cutters like Xuron's (downside is their inability to get into tight spots and cut fragile parts). You can also use a fine-toothed saw (downside is that it sometimes can't get into tight corners and you can also cut yourself and gouge the part if not careful). Seems like there isn't a best way. Actually, I have been using the sprue cutters and saw more than anything. The saw is thin enough to be able to cut off the most fragile parts, but one has to be careful when using it. Once the part is removed from the sprue, it needs to be cleaned up even more using scraping and/or sanding to remove any additional seams and sprue removal nubbins. The part may also need to be repainted again, especially if it was prepainted before removing it from the sprue. Any lost panel lines also need to be restored. Probably the most difficult part to clean up after removal are clear parts, especially if there is any damage done to the transparency while sanding off the nubbin. For this, I recommend a fingernail buffing stick that can be found at any drug store. This has a very soft and fine sanding medium that is perfect for clear bits. A dip in Future floor wax will also help restore the clarity of the part. Frankly, it is the most time consuming part of the kit as just about all parts have mold lines and many have ejector pin marks that need to be treated. Naturally you generally don't do the whole kit at once, but only as you need the parts. The final step before gluing the part is to remove any paint or chrome from the parts to be glued. This is especially true if using superglue as the part will quickly disconnect itself at the first bump. Well, there you have it. A beginning and probably one of the most overlooked parts of building models for the beginning modeler. It is the one thing that takes very little in the way of special tools. However, without good basic parts preparation, you cannot have a really super kit, no matter how much time, effort or money that you spend on other bits or painting. Stay tuned for other bits and pieces in this series. My sister was once bitten by a moose.